Private international actors go to arbitration to avoid adjudicatory risks, especially the risk of bias. It follows that safeguarding procedural fairness is a key concern in arbitral processes, and that exposing actual bias is crucial. However, evidence from both case law and institutional statistics shows that wily parties are willing to abuse procedural fairness and cry bias as a way of delaying proceedings and escaping enforcement, and that the frequency of such spurious challenges is increasing. This insightful book offers a proposal, solidly grounded in legal principle and precedent, for how the arbitration community should respond to this threat. The author shows how ‘dirty’ challenge tactics are made viable primarily by the prevalence of a judicially derived test for bias which focuses on appearances, rather than facts. He argues that the most commonly used test of bias, the ‘reasonable apprehension’ test, makes it easy to allege a lack of impartiality and independence. He shows that the ‘real danger’ test, derived from the decision of the House of Lords in Gough, has a much higher threshold, and has the additional advantage of making the arbitral award stronger at the all-important enforcement stage. bias rules in the lex mercatoria. 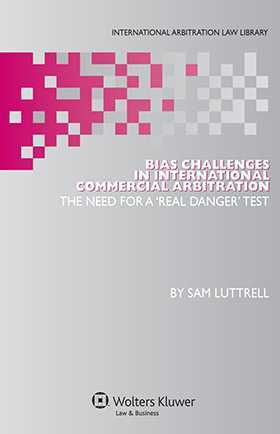 In a broad comparative survey of the law of bias challenges in international commercial arbitration covering all leading states, the author examines various municipal laws to determine their tolerance for a ‘real danger’ clause in commercial contracts. His analysis, replete with case summaries and material facts, provides a strong scaffolding for his thesis, and also probes the causes of the increased rate of bias challenge. The need for a uniform test in this area is made very convincing by this original study. Arbitrators and other interested professionals and academics will find it of unusual value and interest, and corporate counsel will find much to consider in the use of the ‘real danger’ clause. 1. Bias in International Commercial Arbitration. 2. Lord Hewart’s Ghost (England). 3. Varying Approaches in Europe. 5. Competing Tests in the Asia Pacific. 6. Rules of Bias in the Lex Mercatoria. 7. Bias Challenges in Investor-State Arbitration.